A new and revolutionary cleaning solution that aims to make cleaning in the restaurant industry way more simpler is now available. 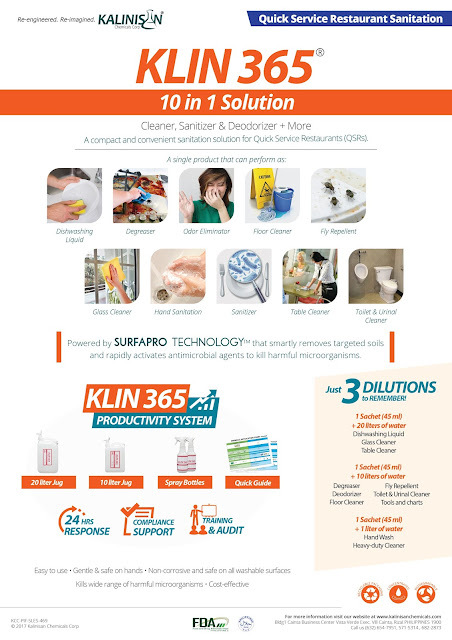 Kalinisan Chemicals Corporation, a proud Filipino company and also a leading developer of cleaning and sanitation products in the Philippines and Southeast Asia, introduces KLIN 365. Its distinct uniqueness is that it is a 10-in-1 cleaning product aimed to simplify the complicated cleaning practices in the restaurant industry. The food service industry needs are undoubtedly evolving so the company came up with KLIN 365 to be able to focus on those needs. Clients from the restaurant and food industries will surely find delight in KLIN 365 since restaurant personnel will no longer use too many cleaning agents just to come up with the right cleaning solution. KLIN 365 will minimize if not eliminate, errors in mixing multiple cleaning agents and correspondingly, would save ample shelve space since there will be no need for other cleaning products. Now, the solution for their diverse and complex cleaning requirements is now made possible—and simpler—with the use of a single product. No more pains of cleaning with KLIN 365 as the hero product for the restaurant industry. By being a multi-use cleaning and sanitation solution, KLIN 365 effectively works as a dishwashing liquid, degreaser, odor eliminator, floor cleaner, glass and table cleaner, fly repellent, as a sanitizer for the hands and kitchen utensils, plus toilet and urinal cleaner, too. This myriad of cleaning functions is what restaurants and food service establishments truly need to keep germs and other bacteria away. This 10-in-1 cleaning solution is easy to use and is totally gentle and safe on the hands. It is non-corrosive and safe on all washable surfaces and effectively kills a wide range of harmful microorganisms to keep the kitchen and other work places clean and germ free. It is a perfect cleaning agent for all cleaning requirements of Quick Service Restaurants or QSRs because it not only cleans but also sanitizes, and complies to established standards of food safety. KLIN 365 is the only product of its kind in the market today, thanks in large part to KLIN 365’s Surfapro Technology™. This groundbreaking cleaning technology borne out of painstaking research by Kalinisan Chemicals Corp.'s Research and Development team smartly removes targeted soils and rapidly activates antimicrobial agents to eliminate dangerous microorganisms. 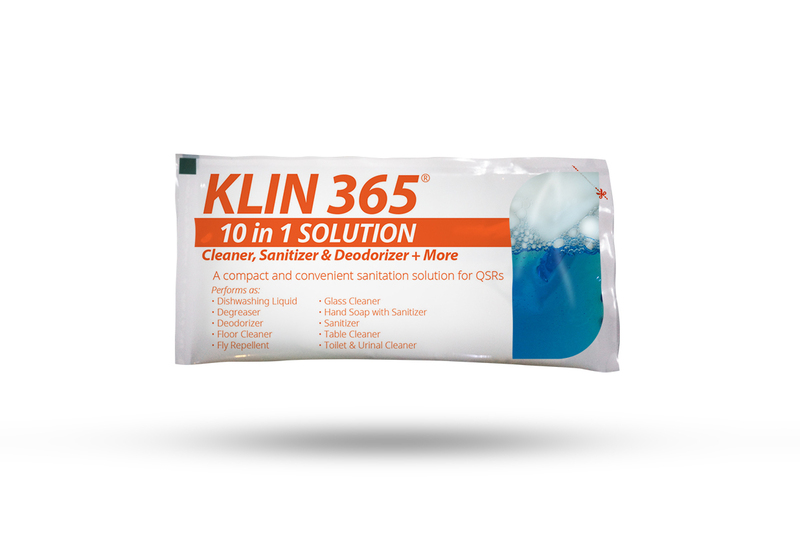 KLIN 365 is so powerful that one 45ml sachet can be mixed with up to 20 liters of water. This mixture can address almost all cleaning needs of a typical restaurant. “We have been part of the food and beverage and cleaning industries for quite a long time. What we did was to focus on our customer's experience – observed their pain and listened to their complaints. And with KLIN 365, we know that we have an innovative and more importantly, useful cleaning solution. Now, our customers are given the choice to simplify the usually complicated process of cleaning. We are proud to have come up with a totally home-grown product that we know will revolutionize the way cleaning and sanitizing is done in the Philippines, which is part of our mission to add value to the industries that we serve through product innovation and excellent customer experience,” explains James Bernardo, Chief Executive Officer of Kalinisan Chemicals Corporation. Get KLIN 365 and other outstanding products and services of Kalinisan Chemicals Corporation through its network of direct distributors nationwide starting August 1, 2017. And for every purchase of a box (100 pieces of 45 ml sachets per box) of KLIN 365, proper product training on usage and application will be provided. For product orders, visit the main office located at Building 1, Cainta Business Center Vista Verde Gate 2, Executive Village, Brgy. San Isidro, Cainta, Rizal or call (632) 654-7951, 571-5314, 682-2873. Visit www.kalinisanchemicals.com or email info@kalinisanchemicals.com for more details.